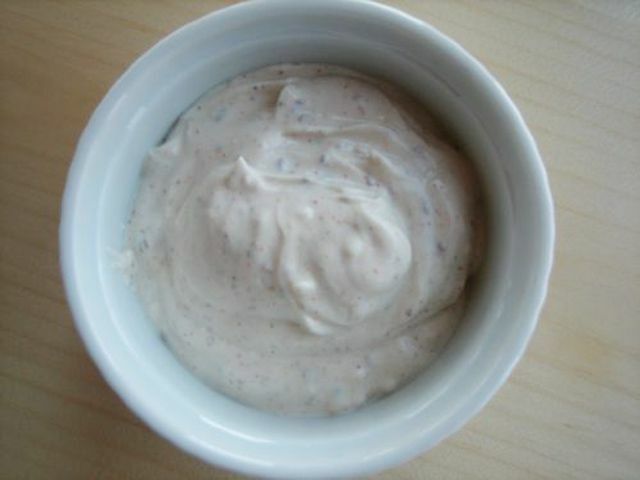 Ground cumin and cayenne turn plain yogurt into an easy and delectable dip for seasonal vegetables. Toasting whole cumin seeds and grinding them yourself make the dip extra special, but store-bought ground cumin works just fine too. The optional sour cream smooths out the dip and gives it a less "yogurt-y" flavor for a more traditional "dip" taste and is completely optional. This tasty dip is perfect for crudites (a.k.a. raw vegetables) of all sorts - carrots, fennel, celery, radishes, cauliflower, broccoli, and beyond! If using whole cumin seeds, heat a small frying pan over high heat. Once hot, add the cumin seeds and cook, shaking the pan or stirring pretty much constantly, until the cumin seeds are toasted and fragrant, about 1 minute. Transfer the toasted seeds to a small bowl or plate and let them cool slightly. Whole the cumin seeds cool off, peel and mince the garlic clove. If you have a garlic press and want a stronger garlic flavor, go ahead and use it! Put the yogurt, sour cream (if using), garlic, ground cumin (if using instead of seeds), salt, and cayenne in a medium bowl. Stir to combine. Grind the toasted cumin seeds in a clean coffee grinder, with a mortar and pestle, or by mashing them with the bottom of a small, heavy pan or mallet. Stir 1/2 teaspoon of them into the dip. Taste and adjust all seasonings to taste. Cover and chill to allow the flavors to blend for at least 1 hour and up to 2 days (note that the garlic flavor will build over time, so if you want to make it more than a few hours ahead, it's best to add the garlic just before serving). Transfer to a serving bowl and serve, chilled or cold, with cut-up vegetables and/or crackers. Make it fancy by adding a drizzle of extra virgin olive oil or a few toasted whole cumin seeds on top. Perhaps it goes without saying, but the yogurt used in this dip should be plain—unflavored and unsweetened. Nonfat and low-fat yogurts are fine, but whole milk yogurt will yield the tastiest possible dip. Want to go full-throttle? Try making your own homemade yogurt.